I really wasn’t up for this race on the day having had a busy weekend and Saturday running also a long training run. Regardless I needed to flyer the race with the local school event and felt this would be good training for me. I went with my friend Trevor due to Alex feeling unwell. Again no high expectations for this due to knowing it was a hilly course and this time last year hadn’t run it due to recovery period from the 100-mile race over that bank holiday weekend. Ran with my dogs in the morning and then a warm up which would equate to 10 miles in total beyond the race. During the race it was a slow start and very congested unfortunately so it meant weaving, feeling tired I was struggling to push 6.50 pace. I remained consistent and tried not to get frustrated climbing the hill just after 2 miles where my friend was catching me. As the race progressed I managed to come off the hill strong and push forward. I led from the start and finish and not at any point looked behind me, often or not with spectators when the clap or say something you normally have a good idea where the next lady is. Again this race having felt low on confidence I had no high expectations, also knowing it was a hilly course and this time last year I hadn’t run it due to recovery period from the 100-mile race. I ran with my dogs this morning and then a short warm up which would total today’s run for 10 miles. Also decided to test out my race kit in preparation for the England Championship race. During the race, it was a weirdly slow start and very congested due to a curved start ( never seen this before !) unfortunately this also meant weaving, feeling tired I was struggling to push 5.50 pace. I remained consistent and tried not to get frustrated climbing the hill just after 2 miles where my friend Trevor was starting to catch me and my lack of hill training was showing. As the race progressed I managed to come off the hill strong and push forward. 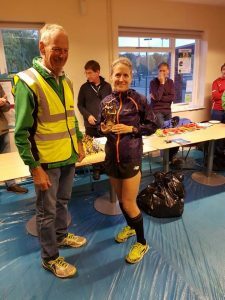 I led from the start and finished first lady in 30.18 which isn’t my fasted and averaged 6.02 pace which for a hilly course I’m pleased with. Again it was progressing and pleased to finish along with a win at a local race. It’s a cruel course and when slightly under the weather takes no prisoners. 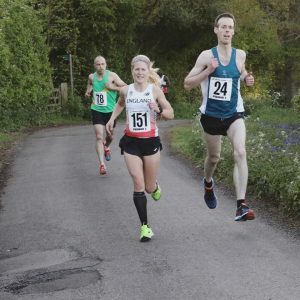 Now onto Bracknell half on the 7th May before a rest week and then the focus of the year ACP 100k.